Home » Uncategorized » Is a Quaddie better value than an All-Up ? What do you think is a better bet ? A Quaddie or an All-Up ? When you take a Quaddie you have to place all bets before the 1st leg. For an All-Up you can decide which win bets to make right up until the start time of each successive leg. You can also shop around for the best odds available on each bet in each leg. But does that make an All-Up bet better value than a Quaddie ? I thought I would carry out a little experiment to highlight the differences. 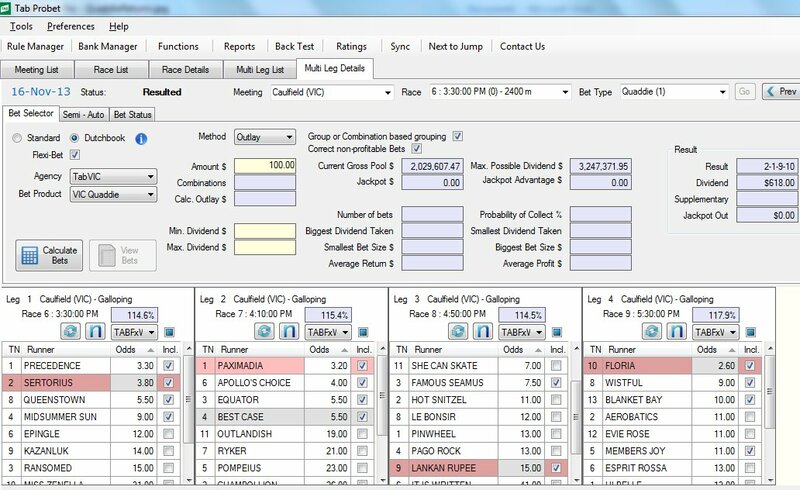 I did a comparison using live data on Saturday 16th November 2013 … Comparing TAB Probet’s Quaddie product verse betting the same runners using TAB Probet’s Dutchbook win bet capability. I have selected the Caulfield Quaddie races which today are races 6 through 9. I have outlaid $100 on the Quaddie (actually only $99.50 ) and have taken 4 selections in each leg. so we would have got back $284.70 for our total outlay of $100. The winner was #10 Floria but I have also included the approximates for the other 3 runners we would have taken. We could have taken it on either NSW or VIC so I’ve shown below both returns. 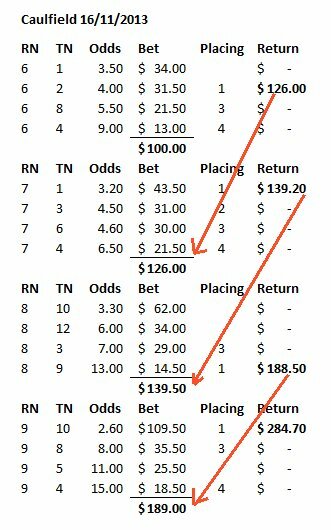 Notice how “consistent” the approximate returns were on VIC TAB and how “lucrative” the approximate returns were on NSW TAB. And the actual return on NSW TAB ($556.43) was almost DOUBLE the return compared with the Dutchbook win based on fixed odds ($284.70). I call this the TAB Probet ADVANTAGE !! The Quaddie will be a better value bet compared with a Dutchbook All-Up about 95 % of the time. Why ? Because in every leg of an all-up there is a bookie margin of around 15%. If you do the maths then that equates to a total take out of 48% of the all-up “pool” . Compare this with a Quaddie where there is only one take out of 20%. So on the average you are 28% better off taking a Quaddie versus All Up betting. By anomalynick in Uncategorized on November 17, 2013 .